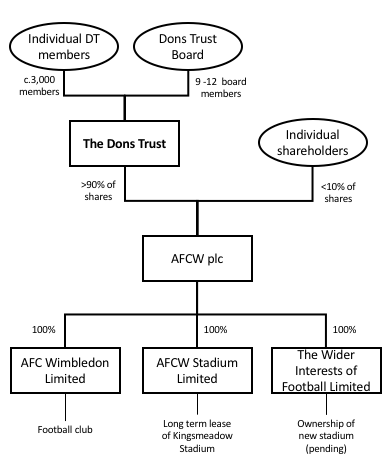 AFC Wimbledon Limited is 100% owned by AFCW PLC which is, in turn, more than 90% owned by Wimbledon Football Club Supporters Society Limited, generally known as ‘The Dons Trust’. 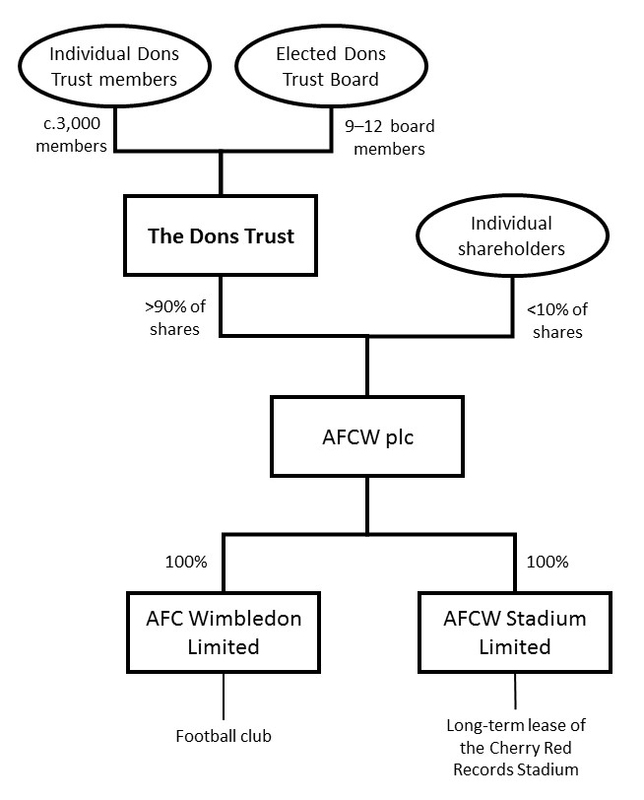 Dons Trust corporate structure (Click on the image to see a larger version). An organisation that represents a large interest such as AFC Wimbledon must have governance and accountability to all both financially and morally. That’s where the Dons Trust does its job. The Dons Trust is a not-for-profit organisation that owns AFC Wimbledon and is guardian of all principles and aims by which it operates. It is committed to strengthening the voice of supporters in the decision-making processes at the football club, and strengthening the links between the club and the community of Wimbledon and the surrounding areas. Supporters Direct, the organisation that promotes supporter ownership, has produced a ‘How Fan Ownership Works’ video that helps explain the concept. In AFC Wimbledon, the Dons Trust now operates and nurtures a wholly supporter-owned community football club that is run by democratically elected officers. We received much help from an organisation called Supporters’ Direct, which came about with the assistance of the House of Commons’ all party Football Task Force. Supporters’ Direct helped supporter groups and promoted the idea of supporter Trusts for active and effective representation within their respective clubs. 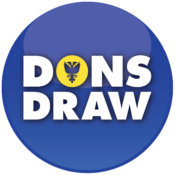 On Sunday 10 February 2002. over 1200 Dons fans crammed into Wimbledon Theatre and voted to create The Dons Trust. By the end of the party more than 750 people had joined the Trust, and a significant amount of money had been raised. The evening was capped off with the parade of the ‘Heroes in Yellow and Blue’ Some of the most famous Wimbledon football names graced the stage including former players Terry Eames, Jeff Bryant, John Leslie, Carl Leaburn, John Martin, Amateur Cup-winning captain Roy Law, goal-keeping colossus Dickie Guy and former Wimbledon manager Allen Batsford who guided the Dons from non-league to the Football League in 1977. In 2012, the Dons Trust celebrated its 10th birthday. You can read the programme article from that day. 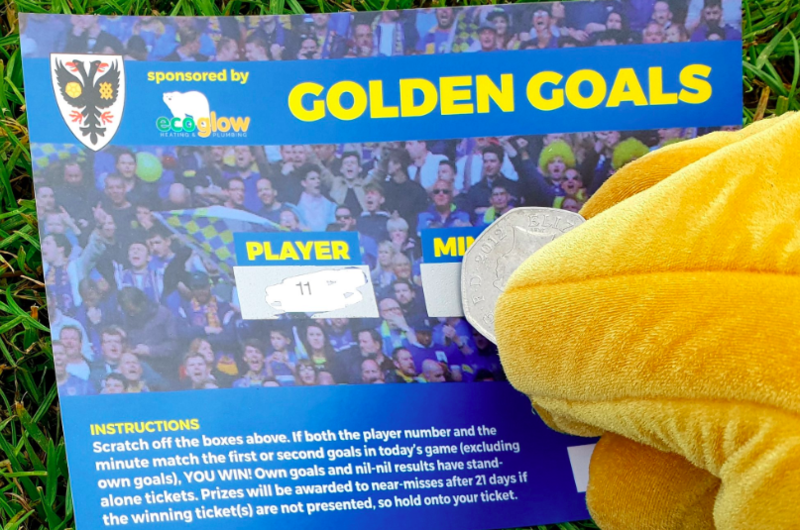 Want to know more about how supporter ownership works? Watch the How Fan Ownership Works video on YouTube. I think the corporate structure needs updating, and also the “larger version” definitively needs to be updated. The corporate structure has since been updated.